This graph depicts the average regular season home attendance of the Seattle Seahawks from 2008 to 2018. In 2018, the average attendance at home games of the Seattle Seahawks was 69,001. 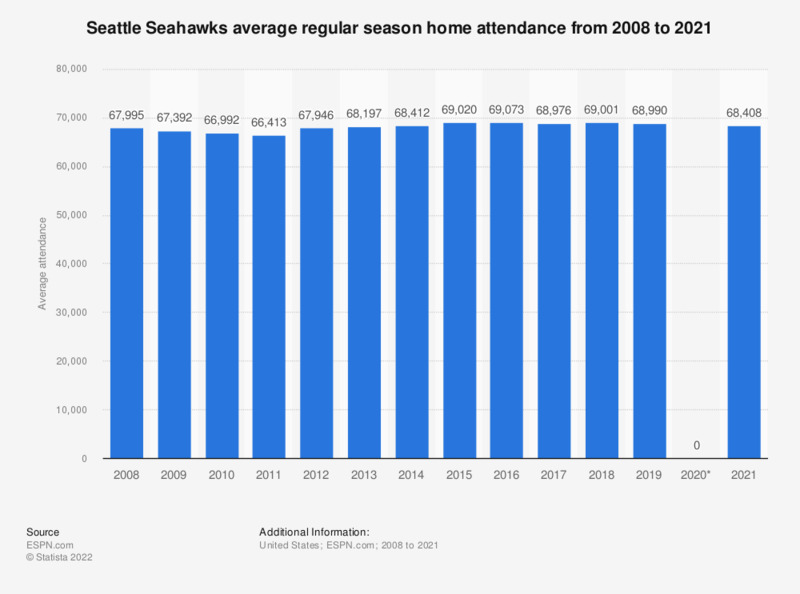 The Seattle Seahawks’ average regular season home attendance has remained relatively constant in recent years, with the average in the 2013 season standing at 68,197. This figure puts the team almost on par with the entire NFL average, which was recorded as 68,397 in 2013. The Dallas Cowboys were the best supported team throughout the 2013 regular season as an average of over 88,000 fans watched each of their home games. The average attendance of the Seahawks was ranked 18th out of the 32 teams in the NFL. A total of 17.3 million people attended regular season games in the 2013 NFL season, over 545,000 of whom passed through the gates of CenturyLink Field, home of the Seahawks. Each of these Seahawks fans paid an average of 71.21 U.S. dollars to watch their team, a figure that increased to over 80 U.S. dollars for the 2014 season. The Seahawks have enjoyed considerable success in recent years, making the playoffs in the 2010 and 2012 seasons. The franchise then went on to win Super Bowl XLVIII in 2013, beating the Denver Broncos 43-8. This marked the team’s first Super Bowl win in its history, having previously lost Super Bowl XL against the Pittsburgh Steelers in 2005. CenturyLink Field was opened as the Seahawks Stadium in July 2002 but was renamed Qwest Field in June 2004 when the telecommunications carrier acquired the naming rights. Its current name was adopted in June 2011 after the takeover of Qwest by CenturyLink. It is also home to MLS team, Seattle Sounders FC, which began its inaugural season in 2009 at the stadium. If you could have only one child, yould you prefer it to be a boy or a girl?